The one and only almanac covering domestic vehicles - the "Japanese Motor Vehicles Guidebook". Approximately 800 cars are introduced in full color. Full specs of each vehicle are included, making this a great reference book for any automobile lover. This year's feature is titled “SMART MOBILITY CITY (SMC)”. 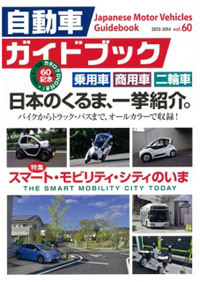 This special feature introduces “SMART MOBILITY CITY 2013” that will be held as an organizer-themed project at the 43rd TOKYO MOTOR SHOW in this autumn. The SMC will introduce “Next Generation Automobiles and the Social Systems” with further depth and in a more comprehensible way the theme of “KURUMA NETWORKING : Vehicles connecting with people’s lives and society”. As the 60th memorial, this volume will append a DVD recording the contents from vol.1 to 59. The Guidebook will serve as a helpful reference when purchasing vehicles and is sure to meet all your expectations.